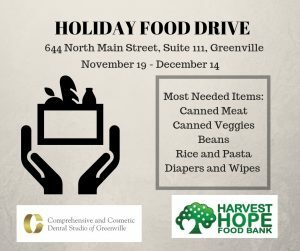 Help stock the pantry at Harvest Hope Food Bank this Christmas by donating to our Holiday Food Drive at Comprehensive and Cosmetic Dental Studio of Greenville. 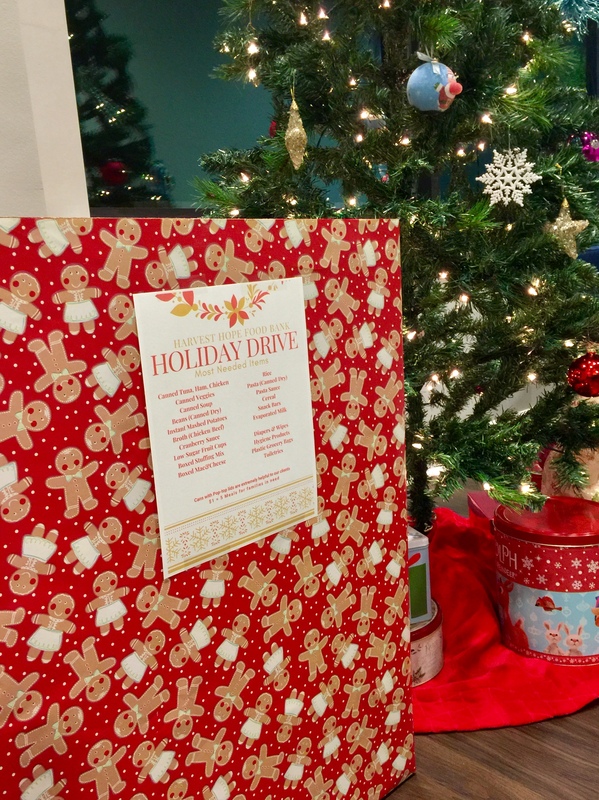 We are collecting donations between November 19 – December 14 at our Greenville office, 644 North Main Street, Suite 111. Some of the most needed items this time of year include canned meats, vegetables, soup, beans, broth, rice, pasta, sauce, boxed stuffing mix, evaporated milk, cereal, diapers and wipes and hygiene products. Cans with pop-top lids are extremely helpful to the clients at Harvest Hope. We look forward to starting a new tradition of giving at Comprehensive and Cosmetic Dental Studio of Greenville. Join us in making a difference! You can make donations any time during our office hours or by appointment. Call Jackie at 864-520-2942, if you have questions or want to schedule a drop off time outside our normal business hours. We want to make it easy to give this Christmas.